First of all, Congratulations! now a ton apps are waiting for you on AppVille*. We hope, you all are excited for getting some unique and remarkable features in PayPlans. We are very pleased to announce that PayPlans is getting ready for 2.2 release and will be released very soon. The not so good news is that it has taken a little longer time. Because we didnÃÂ¢Ã¢âÂ¬Ã¢âÂ¢t want to rush the release, so we decided to take our time and do things rightly to make the customers more satisfied. Faster, due to some significant, performance specific changes. Simpler, due to the user friendly improvement done over the PayPlans. More informative and business friendly, due to collective and detailed statistics related to PayPlans, displayed on single screen. Redesigning and Restructuring of Back-end Dashboard: Dashboard view always remains important because it shows the statistics of revenue. Keeping it in mind, considerable changes in charts are going to be done. Charts will be shown more attractive and informative. Revenue, by using each of the payment gateway option available on the site. 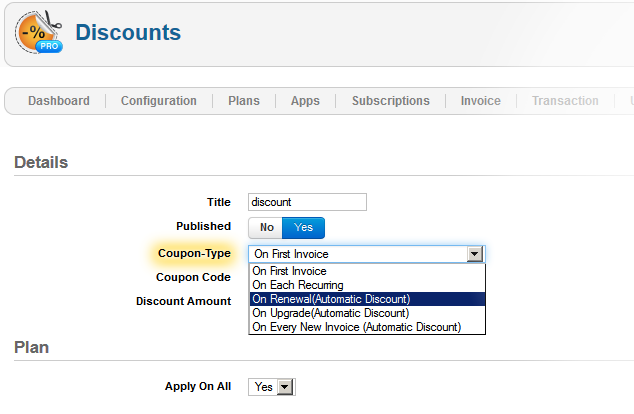 Total usage and consumption of discounts available on your site and the total amount of discount given will also be displayed. Total Upgrades, Renewals and other details. Apps Installation from Back-end: Apps are the most important part of any of the subscription system. For making installation of apps easier, we are introducing an app manager, through which it will be possible to upgrade and install apps from PayPlansÃÂ¢Ã¢âÂ¬Ã¢âÂ¢ backend just by a single click. Use of ÃÂ¢Ã¢âÂ¬ÃÅFile Tree CachingÃÂ¢Ã¢âÂ¬Ã¢âÂ¢ results improved performance: To reduce the loading time of PayPlans, we have started using ÃÂ¢Ã¢âÂ¬ÃÅFile Tree CachingÃÂ¢Ã¢âÂ¬Ã¢âÂ¢ rather than searching required files every time. That will surely make this reduction noticeable as its reduces the time more than 20%. In such cases, it would be great, if it is not required to first create coupon code and then giving discount coupons to the subscriber for applying and getting the discount. We are coming up with some new types of discounts through which, discounts will be given automatically on upgrade, renewal or on new invoice, without forcing subscribers to use some discount coupon. Date format selection from backend: Date format should be used and displayed as per the country rather than forcing some standard. So as per our customers' suggestions, we are giving an option to choose date format. Now administrators will possess the power to decide the date format to be used in PayPlans. By the bye, this is not the end yet. In near future, PayPlans will surely get many more improvements that will make PayPlans more flexible and manageable, in both administrator and customer perspective. Just for now, taking leave from you with a promise to meet soon with much more exciting updates. Stay Connected with us for a gem full of surprises. *Ton Apps on AppVille: Recently, we have released 12 more apps during the development of PayPlans 2.2 and those apps are also compatible with PayPlans 2.1. Have fun.